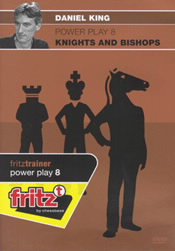 In this eighth Power Play DVD, GM Daniel King examines positions in which knights battle against bishops. He notes in the introduction that this is an incredibly important theme that touches upon any opening you may play. One of his aims is to equip the reader to be able to discern the true value of each piece in any given position, as the standard value of three points can only be taken as a very rough guide, since in certain positions one piece or the other is clearly superior. He begins by showing a few simplified positions that demonstrate the main characteristics of the knights and bishops. First he presents an endgame study by Averbakh in which the bishop proves to be more useful than the knight and then an endgame study by Troitsky where the knight displays its superiority. But his discussions encompass much more than that. He also talks about various positional factors, such as pawn structure, weak squares and how to place your pawns to compliment your pieces. This is not just for beginners, even club and tournament players will learn a thing or two. King does a good job of making the material easy to understand and making complex concepts seem simple. This DVD makes for great self-training and can also be useful to coaches looking for exercise material or lesson plans. In all there are twenty-three video segments with a running time of about four hours. No additional software is needed to run this DVD as it comes equipped with the ChessBase 9 Reader that installs onto your hard disk. If you already have CB9 or one of the Fritz family playing programs, then you do not need to install the reader.